MICHAEL A. VENTRELLA: I’m pleased to be interviewing Peter Prellwitz, one of the most successful writers at my publishing house, Double Dragon. His web page is http://shardsuniverse.net/ . Peter, what made you sign up with Double Dragon, and do you regret going with a smaller press? 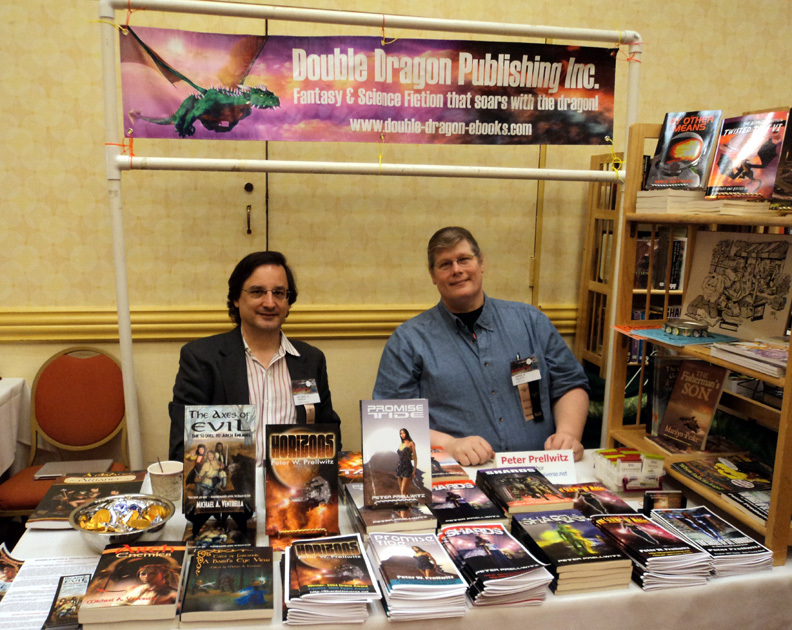 PETER PRELLWITZ: Double Dragon Publishing (DDP) was pointed out to me by a friend who was looking to start up his own publishing company. He’d read my novel Shards back when it first appeared in serial form on the CompuServe Writers Forum and became a supporter to see it published. (I’d originally written the novel just for my own enjoyment, with no intention of publishing it.) At the time, Double Dragon was conducting its first – and sadly, only – Draco Writing Contest, so I entered four of my finished novels, Horizons, Promise Tide, The Science of Magic, and The Angel of St. Thomas. I didn’t enter Shards because the four books making up the novel totalled three hundred thousand words and I knew better than to submit something of that size, having never been published. All four books fared well in the judging, with Horizons selected by finalist judge Mike Resnick as the Winner for Best Science Fiction. I have never regretted going with a smaller press, primarily because that smaller press was Double Dragon Publishing. I have always been treated cheerfully, professionally and politely. This can be tempting to think, “Sure, they treat me that way because my sales are pretty good.” But the undisputed truth is the company treats all its contributors that way. VENTRELLA: Given the cutbacks at the big publishing houses, would you advise other starting writers to “build a portfolio” by having success with a small publisher or is it better to keep holding off for that big potential deal? PRELLWITZ: Having just crowed over the joy of being with Double Dragon doesn’t mean there aren’t challenges and downsides to being signed by an ebook publisher. One of the biggest is the “stigma” that comes with it. The sad truth is that there are a LOT of ebook/small publishing houses out there that have poor business practices, very low standards for accepting materials, and are about as real as faster-than-light travel. The mainstream publishers and associated agents, editors and such have maintained for years that ebook/small press publishing was no better than vanity press, and not to be taken seriously. Sadly, more often than not, they’re absolutely right. There’s an overabundance of – forgive me – poor quality writing that is being published by ebook/small press publishers that has little or no merit to it and is seeing print only because of their publishers’ inexperience, vanity or outright greed. That means that real publishers like DDP, who have high submission standards, a winnowing process, and sustainable business/publishing models, are unfairly lumped into the same group as so-called publishers. Because of this, while the idea of “building a portfolio” with a small publisher sounds good, it can actually hurt you in the respect of building a reputation among the larger, more conventional publishing companies. And literary agents won’t even look at work you’ve published with ebook/small press publishers. But there a many positives to going with the right small publisher. One is the self-realization that you’re a serious writer; you’ve tried to get your work published. Another is that your chances of getting read and signed are greater with an ebook or small publisher. Just be sure you go with a reputable publisher. I do believe the time is coming when there will be a blending of some elements in the ebook publishing and mainstream publishers. The ebook and small publishing companies are far more efficient; not wasting paper but rather using print on demand (POD) or electrons to put out books, as opposed to the tried and true but increasingly expensive and wasteful mass publishing model that the larger houses use. Being a known, respected author with a known, respected publishing house, be it ebook, POD or mass, is a good thing. PRELLWITZ: I’m afraid I’m a nightmare of an example when it comes to the writing process. I’m what you would call a “seat of the pants” writer. I no idea how a novel is going to end, nor even what’s going to happen in the next chapter or even the next page. Oh, I’ve tried to do the outlines, plot summaries, character direction, and etc. For ten novels now, though, it hasn’t worked. I introduce my characters to the initial conflict that needs to be resolved, then just write down what happens. If I ever try to step in and direct things, they either smack me down for meddling in their lives or they stand around and go on strike like a bunch of prima donna actors. In one novel, TAU (which stands for Those Above Us), I set up one character to be the penultimate bad guy; then traitor everybody wants dead. I built this massive case of evidence against him and then, one chapter before the end of the book, he dies a noble death. He’s NOT the villain I was certain he was. Which left me completely in the dark as to who WAS the traitor. Took me a couple weeks to figure it out, and when I did, I couldn’t believe it. But when I read through the novel, there it was. I’d laid out – rather, recorded what I saw – everything that was needed to prove the guilt of the traitor and I’d missed it all. As for planning out series, I do and I don’t. Oftentimes when I’m working on one novel I’ll write a reference to an event or person that has only tangent relevence at that moment but promises to have a good story on its own. Several novels and a couple dozen short stories have come about that way. I will start and work on more than one book at a time, however. Generally, I don’t recommend it. In my opinion, it’s far better to focus on one novel. Right now I’m writing a Shards Universe novel and a Martian Western novel and a fantasy novel. They’re all moving forward, but slowly. They’ll probably all be finished about the same time, which will be cool because I’ll have three completed novels. But until they’re finished, I don’t have anything to offer my readers. That’s okay before you get published, but once you establish a fan base, you owe them more than vague progress updates. VENTRELLA: What’s your writing background? Did you begin with fiction? PRELLWITZ: I did. My first “published” work was a Thanksgiving play I wrote in 4th grade. My teacher was so impressed that I’d written completely on my own (it wasn’t an assignment or anything), that she produced it and it played to the entire school. It was an awful play. Elements of Gilligan’s Isle and F-Troop, poor dialogue, no logical progression to plot, and a cookie-cutter ending. My mom saved me a copy of the play, so I was able to refresh my memory about it. Yep, it was awful. But it was produced and it was my creation. I wrote another, much better Thanksgiving play in fifth grade, which was also produced, this time by my fifth grade teacher. After that I started writing short stories and started about six different novels that I never took more than a hundred pages. I co-wrote a melodrama in my senior year that was produced and played in nine libraries around Orange and Los Angeles counties in 1978. We got our fist official reviews from that; two thumbs up from both the Orange County Register and The Los Angeles Times. I continued writing fiction and non-fiction through the years, my break coming in 2003 with Horizons. VENTRELLA: Is a web page important for a starting writer? One trap an author can fall into is that his or her “job” is to write and only write. Indeed, in the past – say, the 19th Century – a well-known author need only send his completed manuscript to his publisher, then sit back while other people did the rest of the work. Marketing, publicity, etc. The author had only to keep writing and occasionally show up at lecture. Not only are those days gone, I wonder how much they really ever existed. If you look at Samuel Clemons’ life, you’ll see it was nothing like that. Today, however, the author must also be the main source of publicity. Also, simply writing a novel isn’t the only option. There are so many opportunities to add to the novel’s audience and reach, that NOT taking advantage – especially when so many other authors are using the chances – that an author is really short-changing the novel’s life. Web sites are a critical opportunity that should not be passed up. And I don’t mean a typical “Buy My Book!” vanity web site. Having a living, breathing web site that you update regularily, store plenty of free stuff on, and just generally increase a readers involvement in your writing, can be the difference between your book just sitting on the shelf and your book gaining a following. For the starting writer, I would recommend having a web site up and running at the same time you’re writing your first novel. When I was writing Shards back in 1996, I started the ShardsUniverse.net site mostly for myself. I kept my research, connecting short stories, maps, and everything else there. I didn’t let anyone really know about it. When I’d finished Horizons in 1998, I did more of the same. It wasn’t until 2003, when Horizons was first published, that I began pushing my web site. By then, however, it was a wealth of information on my universe, with a free library of short stories, novel excerpts, research, and current news on conventions and the like. Since the majority of my novels occur in the same universe, the web site helped tie everything together. A tip… I put up my first web site all by meself. I wish I hadn’t. Even though I’m a professional IT person, I’ve never been big on web design. If you have a couple hundred bucks, PAY a professional to set up your site if you’re seriously going into the writing world. I’m doing that now, but it’s an ugly, slow process since I have a lot of content to move over. 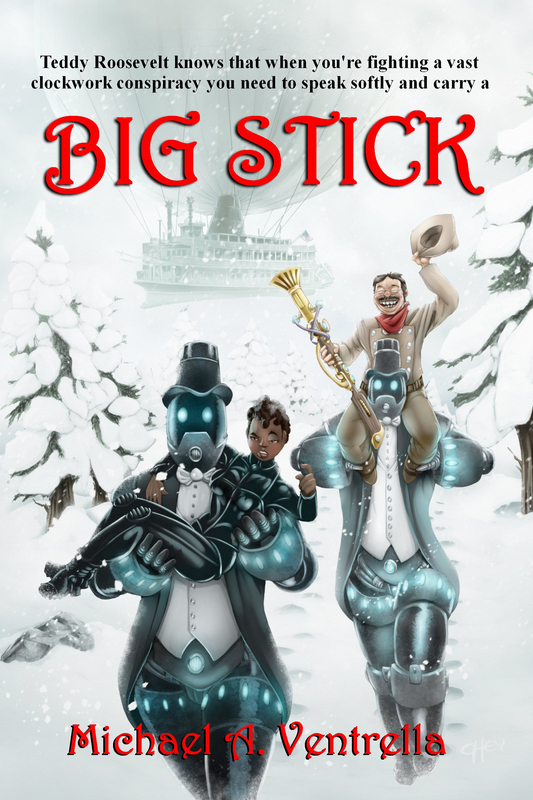 VENTRELLA: How does writing for comics differ from writing standard fiction? PRELLWITZ: As you know, I’m currently working with Steve Bennett, the anime artist, in turning my young adult novel, The Angel of St. Thomas, into a web comic of the same name. It’s been challenging. Since the medium is so very different, illustrated as opposed to written, rewriting is an absolute must. Where I could use the reader’s imagination to help me tell the story in the novel, as a web comic I’m more compelled to provide visual story-telling. While this forces me to provide more detail in the form of instruction to the artist, the result is a universal representation of what I’d envisioned when I first wrote the story, as opposed to my letting the readers’ imagination fill in the blanks. Pacing is also a huge challenge. The novel can be read in two or three hours. The web comic, which only posts one page twice a week, will need three years to tell the same story. Because of that, action scenes need to be enhanced while exposition and transition sequences need to be condensed. Taking three paragraphs of exposition in a novel is a one minute read, filled with useful information. But drawing three paragraphs of information might take four or five pages, which is two weeks worth of web comics in which nothing is happening. So adjustments are needed. Sometimes major adjustments. For instance, one chapter has the main character telling the origin of the “Angels” to another character over dinner. In the web comic, we’ll be having her showing the story; the reader will go back and watch things as they occurred from three centuries earlier. The other primary difference is also the most exciting and, yes, at times challenging difference. The story is mine. The characters are mine. But the art is Steve’s, and he’s as much a creator of the web comic as I am. What I try to convey in a script isn’t necessarily what he’s going to draw. Not one single page has been exactly as I thought it would be. But at the same time, every page, while different, has been better. He’s the artist, after all. What he doodles in two minutes I couldn’t draw in two weeks; Steve is that good. So we always have an exciting and sometimes energetic exchange of ideas. That’s forced me to better see things as an artist does, which has helped me become a better writer when it comes to scripts. And being able to write scripts is always a useful skill. VENTRELLA: You make regular appearances at science fiction conventions as a guest author; do you find these to be a useful process to promote yourself? PRELLWITZ: Yes, and I think your question touched on the often overlooked main point. Conventions are a great place to promote MYSELF. Almost all other means of promotions, youtube, web sites, even book signings, are to promote the book. And my books are certainly the reason some people want to meet me. So when I’m at a convention, I’ll have a table in the Dealers Room and talk about/sell my books. But this is primarily the way my readers – and potential readers – get to meet the person behind the stories. To hear my opinions and my life experiences, as well as witness my reactions to and interactions with events as they occur at the convention. PRELLWITZ: : In all honesty, I don’t think I’ve made it yet. I’ve had a very fortunate career as a writer to date. I continue to write, though not as much as I should, which is a common Biggest Mistake for authors. Though I do wish I hadn’t started playing World of Warcraft. That’s eaten up hundreds of hours I could have spent adding to my universe. A lot of my readers often ask, “Why aren’t you in all the bookstores?” which is to say, “Why aren’t you with a mainstream publisher?” But I never for one moment think of my loyalty to Double Dragon as a mistake. Yes, I might have been able to get published with a big publishing house. But I DID get published with DDP. And now that I’ve proven myself to me and to a growing number of readers, I am trying to go mainstream with my next novel, Redeeming The Plumb. And I have DDP’s blessing and support. And if I have my way, DDP will always have my ebook contracts. So, this is the only question I guess I’m dodging, because I really haven’t made my biggest mistake. PRELLWITZ: My advice is three-fold. 1.) Buy, read and KNOW “The Elements of Style” by William Strunk and E.B. White. This slim book is a must for any writer. 3.) Write crap. If the aspiring writer accepts that he or she will be a better writer in ten years, then the writer must also accept they are a POORER writer now. Don’t wait until the perfect inspiration comes along. Flowers can grow alone and by themselves, but a truly beautiful flower requires fertilizer to grow from, as well as less beautiful flowers nearby with which to be compared. The same is true for writing. Start writing and keep at it. You will write junk. But you’ll learn. And you’ll get better.